Red Norvo: 'The Savoy Sessions' Known as "Mr. Swing," Red Norvo became a jazz star while playing an unconventional instrument –- the jazz xylophone. He later switched to vibraphone, and recorded with such legends as Benny Goodman and Dizzy Gillespie. 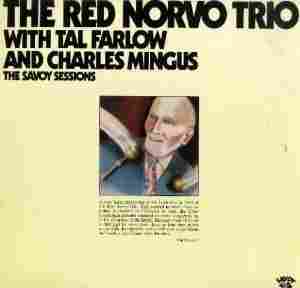 On The Savoy Sessions, Norvo teams with bassist Charles Mingus and guitarist Tal Farlow. A.B. SPELLMAN, National Endowment for the Arts: This is quite sophisticated music and yet it's very accessible. It's the trio of vibraphonist Red Norvo. And, Murray Horwitz, why is it in our NPR Basic Jazz Record Library? MURRAY HORWITZ, American Film Institute: Well, A.B., there it is — sophisticated yet accessible — you've already said it, so I can go home now. SPELLMAN: If you would be so kind! HORWITZ: Well, you know, when I played this recording of Irvin Berlin's "Cheek to Cheek" for my wife, she said, "It's amazing. It sounds like a human voice." And, I think you're right, and I think she's right. This music is very hard to do. It's very carefully put together, and at the same time, it's so easy on the ears. HORWITZ: You can almost put your hands out and touch this music. It's a historic trio: bassist Charles Mingus, guitarist Tal Farlow, and the highly undervalued Red Norvo, who led the group in 1950 and '51. Three virtuosos. Three outstanding jazz soloists, and three men, who could play together as one. HORWITZ: Colorful harmonies, novel rhythms, all kinds of special effects. You'll hear Mingus scrubbing the bass, and Farlow popping his strings percussively. The best jazz trios, I think, achieve a kind of orchestral sound. It's greater than the sum of its parts, and what parts they are. Tal Farlow's guitar technique was such that his nickname was the octopus, and Mingus declares himself here as an important next step in the development of the jazz bass. HORWITZ: Red Norvo has an astonishing jazz resume in an almost unmatched range of styles from a musician of his generation, but he always had the audience well in mind. And this record just shouts out how much all three of these men just loved music. SPELLMAN: It's the Red Norvo trio with Tal Farlow and Charles Mingus. The album is The Savoy Sessions, and of course, it's on the Savoy label. For NPR Jazz, I'm A.B. Spellman.